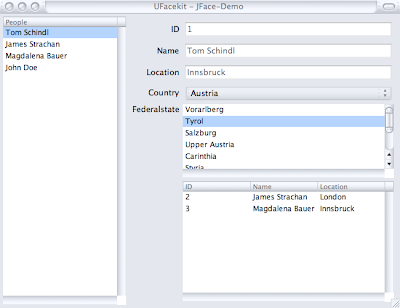 A month ago James Strachan and I started hacking on a project we named UFacekit. We both faced the need to write datacentric applications for different deployment environments (Desktop (Swing/SWT), GWT (MyGWT/GWT-Ext), …) and we thought there must be an easy and fast way to come up with something that makes our day job easier. At this very moment UFacekit was born. There are different things we are targeting with the project. Instead of writing an SWT-Port for GWT/Swing (I know for Swing there’s already an SWT port) we decided to go the Facade/Factory way and started hacking and the progress we made in this very short period of time (we are only working on it in the evening) is more than amazing. Take a look at the following Screenshots they show what’s already possible with the current sources. They look fairly identical (the only reason they not look completely the same is that I haven’t ported the GridLayout from SWT to Swing but relying on Mig-Layout). 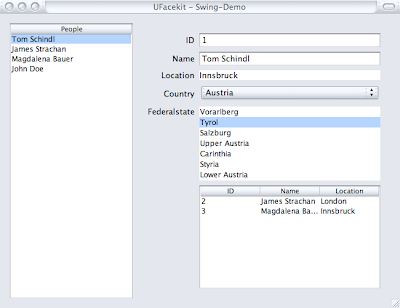 You can even more reduce the size and complexity of the source by using FormBuilder-classes we are going to provide to make creating standard-forms like this as simple as possible. Before we are publishing a first cut we need to finish the GWT-implementation (GWT/MyGWT/GWT-Ext) but we (in this case James) are on a good way and we should have a release fairly soon. Naturally there are some gaps (e.g. missing widgets, API inconsistencies) but hey the project just got 1 month so I hope you don’t mind. Did this spot your interest? Come and join our google group and share your ideas with us. i applaud your initiative–nice work, great progress, thus far!